Kent Monkman is a Canadian artist of Cree ancestry who works with a variety of mediums, including painting, film/video, performance, and installation. He has had solo exhibitions at numerous Canadian museums including the Montreal Museum of Fine Art, the Museum of Contemporary Canadian Art in Toronto, the Winnipeg Art Gallery, and the Art Gallery of Hamilton. He has participated in various international group exhibitions including: The American West, at Compton Verney, in Warwickshire, England, Remember Humanity at Witte de With, Rotterdam, the 2010 Sydney Biennale, My Winnipeg at Maison Rouge, Paris, and Oh Canada!, MASS MOCA. Monkman has created site specific performances at the McMichael Canadian Art Collection, The Royal Ontario Museum, and at Compton Verney, he has also made Super 8 versions of these performances which he calls “Colonial Art Space Interventions.” His award-winning short film and video works have been screened at various national and international festivals, including the 2007 and 2008 Berlinale, and the 2007 Toronto International Film Festival. His work is represented in numerous public and private collections including the National Gallery of Canada, Montreal Museum of Fine Arts, Museum London, The Glenbow Museum, The Museum of Contemporary Canadian Art, The Mackenzie Art Gallery, the Art Gallery of Ontario, the Smithsonian’s National Museum of the American Indian and the Vancouver Art Gallery. 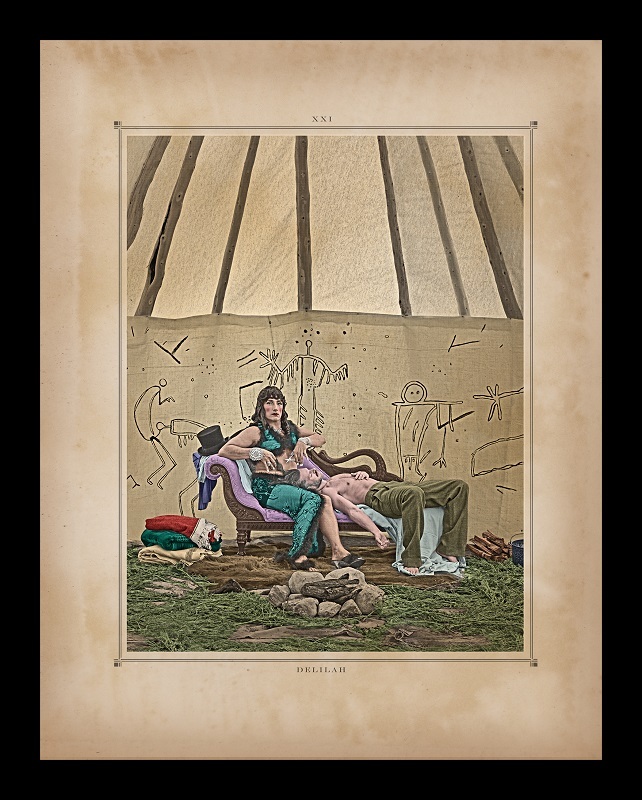 Kent Monkman talks about "The Rendezvous"
Gerald Peters Gallery, New York is pleased to present new works by Cree artist Kent Monkman. The exhibition will be curated by Eileen Braziel, Director of Peters Projects. 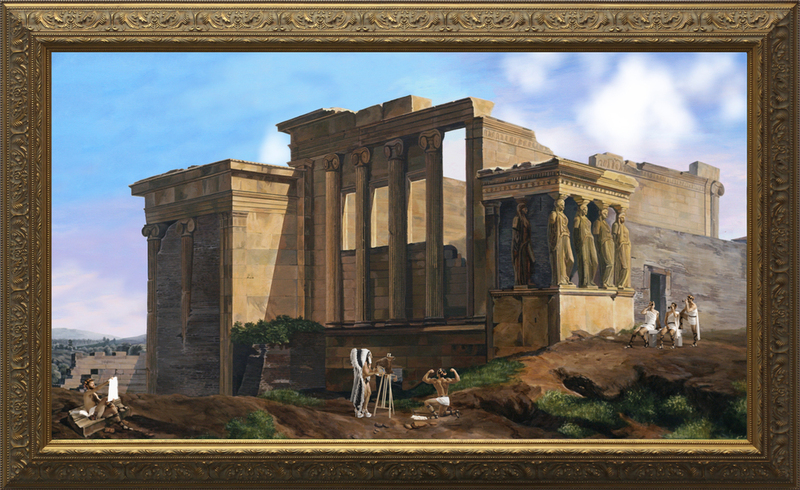 Kent Monkman will exhibit his latest works including video, painting, photography, wall design, and drawings. 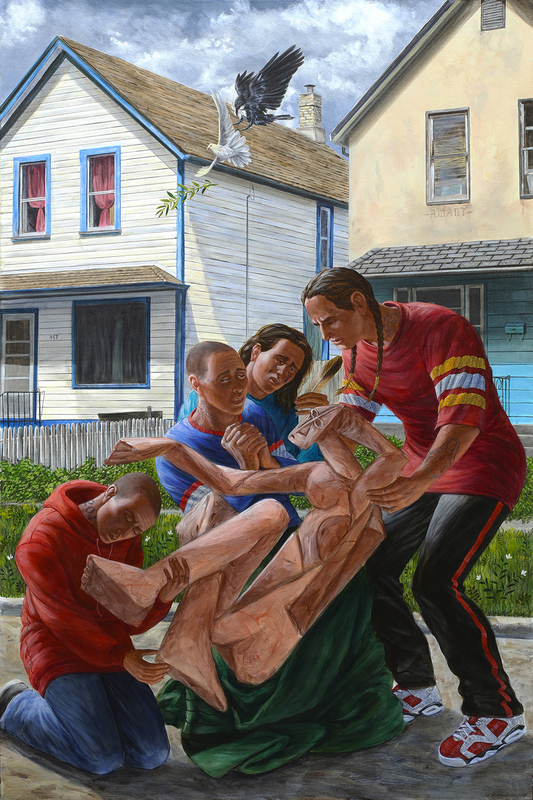 In addition, Kent Monkman’s new works will be exhibited in the five day long Volta NY curated exhibition by Wendy Vogel. 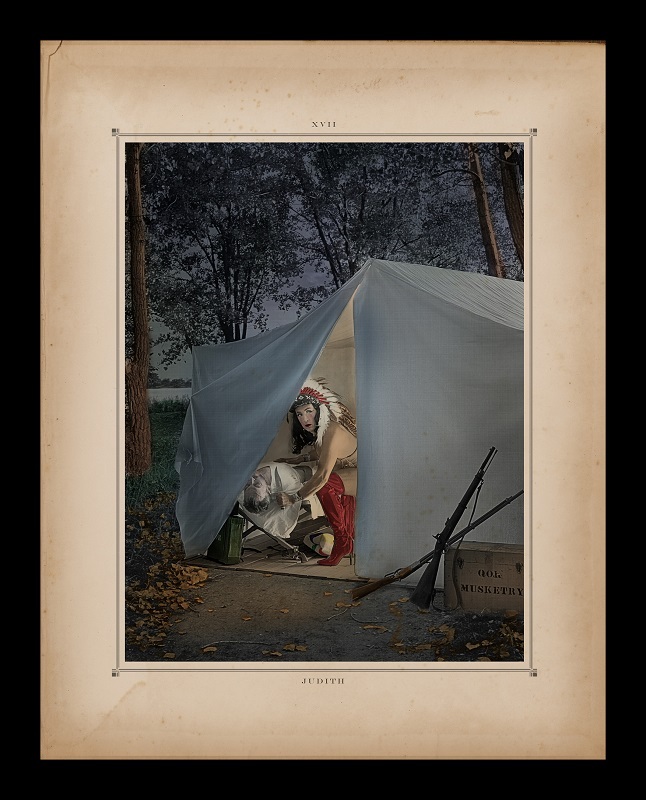 Vogel will focus on LGBTQ and feminist dialogue in Kent Monkman’s artwork. Monkman’s new paintings appropriate Nineteenth century western artist, Alfred Jacob Miller. “Drawing upon mythological sources, both European and Native American, my series of paintings will feature dynamic scenes of indigenous peoples, mountain men and trappers in various scenes of revelry and interaction. I will include animals in the scenes as they are central to mythologies- from Greek myths to indigenous legends-that express the most profound aspects of human existence and shape our understanding of nature and the cosmos,” says Kent Monkman. Kent Monkman's exhibition Shame and Prejudice: A Story of Resilience ushers in Canada’s Sesquicentennial in 2017 at the Art Museum at the University of Toronto. 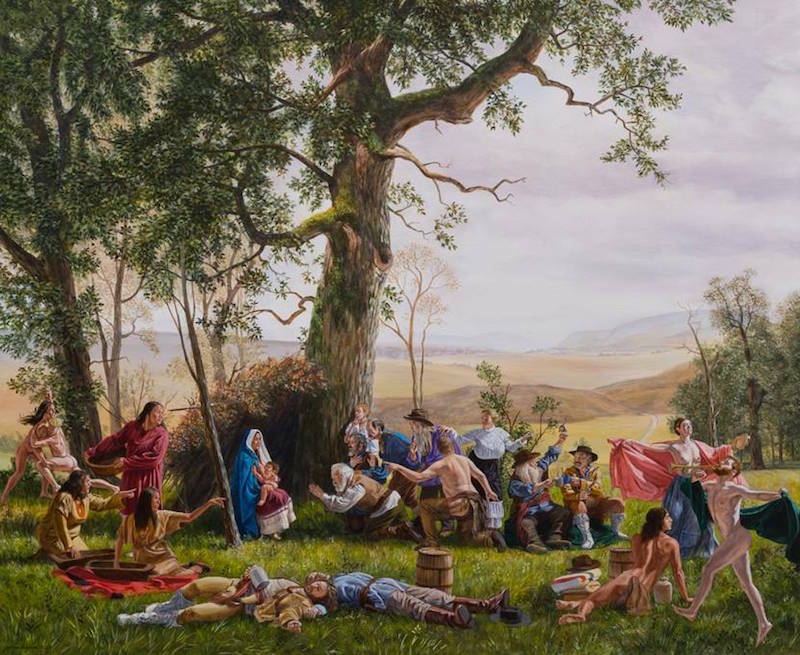 Kent Monkman’s new, large scale project takes the viewer on a journey through Canada’s history that starts in the present and takes us back to a hundred and fifty years before Confederation. With its entry points in the harsh urban environment of Winnipeg’s north end, and contemporary life on the reserve, the exhibition takes us all the way back to the period of New France and the fur trade. The Rococo masterpiece The Swing by Jean-Honoré Fragonard is reinterpreted as an installation with Monkman’s alter ego, Miss Chief Eagle Testickle, in a beaver trimmed baroque dress, swinging back and forth between the Generals Wolfe and Montcalm. After premiering at the Art Museum at the University of Toronto, this large scale exhibition will travel across Canada over the next two years. A catalogue is forthcoming in the fall of 2017. It will be published in English, French, and Cree. Peters Projects will be representing two paintings in the exhibition (Seeing Red and Le Petit Déjeuner sur l'herbe). When she helped coordinate a project of Chinese dissident Ai Wei-Wei with Navajo artist Bert Benally in a remote canyon in western New Mexico in 2014, Eileen Braziel became increasingly fascinated by land art, and by what happens when the worldviews of Native and non-Native artists come together. Now, after coming to Peters Projects not quite two months ago as director and curator, Braziel is bringing a series of exhibitions to the gallery from artists who will be coming to the state to collaborate with Native individuals for new art that will be inspired by, or actually be installed on, New Mexico lands. The year-long thematic program, which opened last weekend with an exhibition of works by Canadian artist Kent Monkman (Cree/Irish), is titled “Outside-In.” The title could be interpreted as non-Native artists looking in on Native cultures, non-mainstream Native artists being incorporated into the established art world, or even arts projects and objects from the outdoors being brought inside the gallery doors. “We’re trying to be as open as possible to what comes out of this,” Braziel said. With cross-cultural sharing, the result can be a brand new type of communication, even something that could challenge art critiques of the future, she said.